Here's a card that's been caught in a photo of my desk earlier this month. That was when I was working ahead and thinking how great I was. Pride comes before the fall, and of course, I'm not great and indeed, I'm a little behind. Christmas Cards. Do 'em for private use, or don't do 'em. Whichever way I go, the decision has to be made this week. After all, they need posting or delivering in about 4 weeks, otherwise it's not worth the effort. Is it? 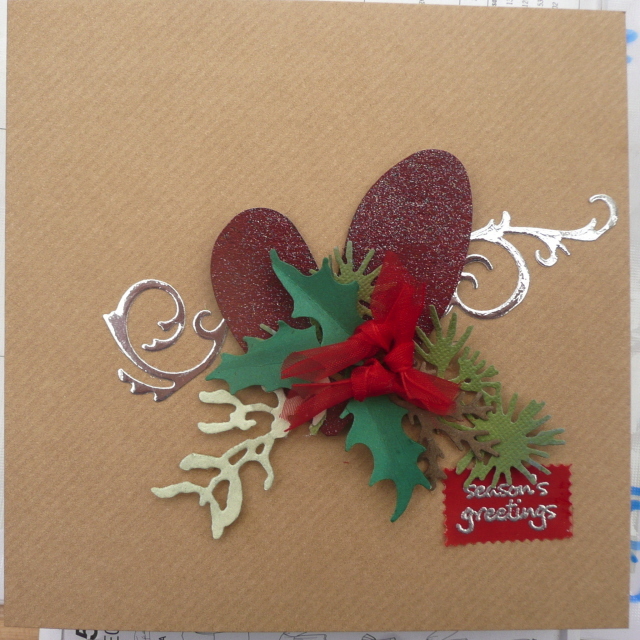 This Thursday I conduct the first of quite a few Christmas card workshops - which is why this card is already made. And I'm showing you because it ain't exactly a lesson in technique so I figure no-one will be cheated by seeing it earlier! It's the Tim Holtz Christmas foliage die and a Tim Holtz Heart die too....cut from grunge paper and inked and sprayed with glittery shiny stuff. See, I can use the TH stuff, it just doesn't involve much grungy art in my hands. 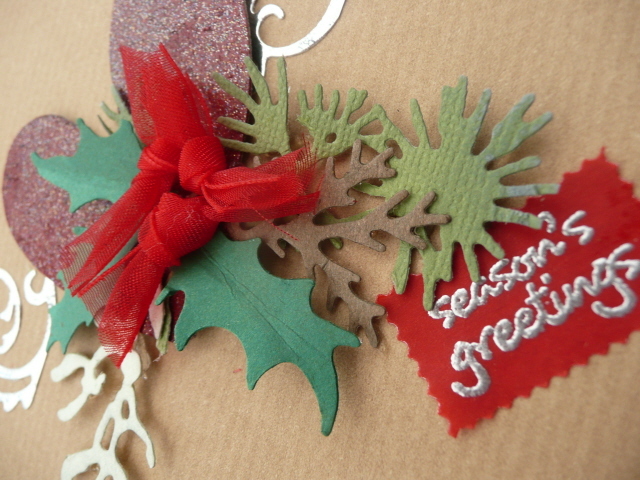 I used iddy bits of ribbon for holly berries just to keep on with the dimension thing. That's the thing about my workshops see. I don't really bother about your difficulty or cost in posting them..that's kinda not my problem. Obviously, if you don't want dimension, you will choose a one layer card workshop, or stick everything flat and that will be the gorgeous free will in action. Meantime, silicone glue and foam pads are my glues of choice. You may want to track the number of sprayed sparkly and shiny elements I use this month....the spray smells wonderful! So this cloak was a yellow velvet curtain and the leather chest strap was a belt. 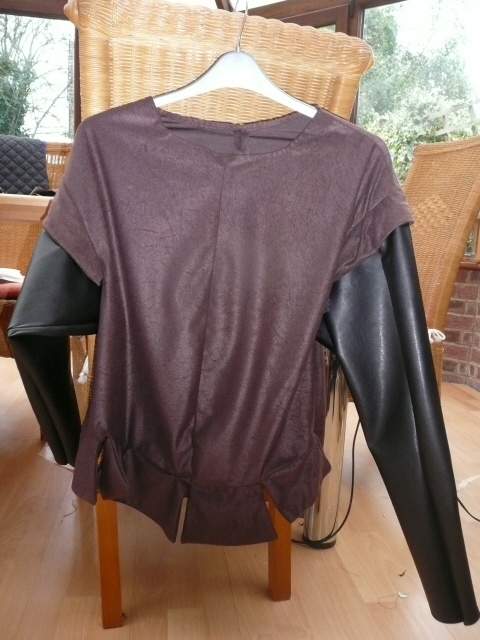 ( A benefit of volunteering for a charity shop is the first rummage in the donations!). 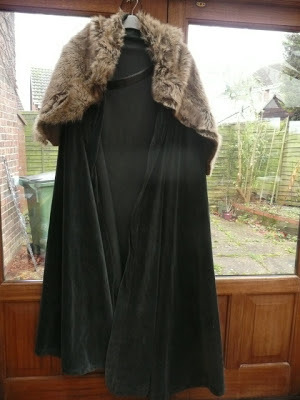 The fur shoulder throw was a gilet from Primark...actually on, the cloak looks very good and the fur looks very much like it was thrown over for added warmth. And here's what you saw in pieces on Wednesday. A doublet. There's also trousers and padded thigh guards and Mr Dunnit has made a fabulous sword...a picture of the 'works' has to wait until it's all been revealed to the ComicCon world! So a round of applause to Miss Dunnit for inventiveness and staying power. She didn't just make her own outfit. No sir, she made the one her chum will be wearing too. Apparently, her chum is too busy at University. I know there's sarcasm there, and that makes my daughter a better person than me, for sure. Which is what the world needs, so that's OK. So, while Miss Dunnit sweats her way round London's Excel, I'm planning a day of normalness for today and a day at my desk for tomorrow. I'm quite excited as it will be the first time for a week. Crop weekend is creeping up...I need to get back into nerd mode and start preparing! Have a lovely weekend. And if you live in the northern hemisphere - stay warm and put your clocks back tonight! Here's another card with foiling...a cuttlebug folder embossed on Kraft card and then the raised detail 'coloured' with hologrpahic foil. I promised to talk a bit about the foiling/leafing that I've used on cards recently posted. Try not to yawn - click away if it's all old hat to you! The autumnal ferns at left are gilded with Leaf. 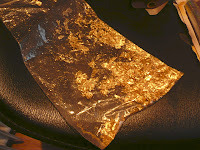 It also comes described as Gilding Flakes. It comes in boxes or packets of sheets in gold, silver or copper, for example. Once burnished, all the biddy bits and crumbs it creates can be saved for extensive re-use. It has a soft glow to it and is probably the messiest medium I use in terms of static and cling. I always decant the leaf into a large zip lock bag and try to work inside the bag when the glue is dry. If you try it, you'll see why. Don't be put off by this...the tidy up effort is teeny compared to the reward! So sorry about the naff photos of the foil...the light in this hemisphere is pants this morning. 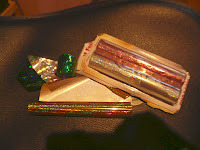 The foil that I use is on rolls (but you can get it in sheet form). Here (as in, in England) it's described as 'Hot Foil' and you can use it with one of those heated wands to do freehand application to all sorts of surfaces. Comes in any number of colours and choices - holographic or plain, etc. It's basically a sheet of plastic that has a removable metallic coating on the underside. When your glue is ready, place the foil, face up over the glue and burnish. Lift away. Any colour left on the carrier sheet is good for re-use. The carrier sheet, when fully used, will be transparent. Quite a cost effective medium I tell ya. You can use most any wet glue...indeed the small kit that I first bought contained 6 1" wide reels of foil and a tube of glue that Mr Dunnit reliably informs me is good strong PVA. Either spread it thin or be patient. The key with all the gluing is patience...it really needs to be dry but sticky. Which is why I use the Zig pen...it's obvious when dry enough and fast-drying enough to keep my attention! If it isnt dry, the foil will actually just lift the glue off the card. 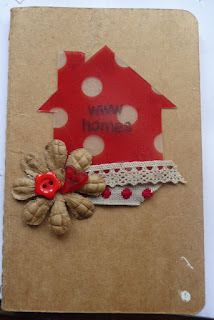 Remember, if you use a heat gun to dry the glue, you might end up wrecking any lovely heat embossing that you've previously done on the card. Usually, the foiling/leafing, is like the glitter glue..pretty much the last thing I do to a card. In the case below, the moon is foiled, the glue was drying while I stamped and cut out the tree trunks to overlay the original image. Coincidentally this was the card that caused agonies in a workshop between the 'eyeballers' (me) and those who prefer precision (most everyone else). Normally, I would pre-cut card stock and mounts to size to save the workshopeers the trouble and boredom. But imagine if I'd pre-cut the gloss card upon which the image is stamped. How many of the precision lovers do you think would have been un-shakey enough to fit the image on as precisely as necessary? Far easier, I thought, to give out bigger pieces of stock and have the workshoppers cut to size. See, you make one thing easier and it makes another thing harder. But that's possibly a statement that should apply elsewhere. Here endeth the foiling lecture. Go get coffee, the rest of your day depends on you being awake. Oh my word, I've migrated into the conservatory. And oh my word, I'm being the super- mother-of-the-year. 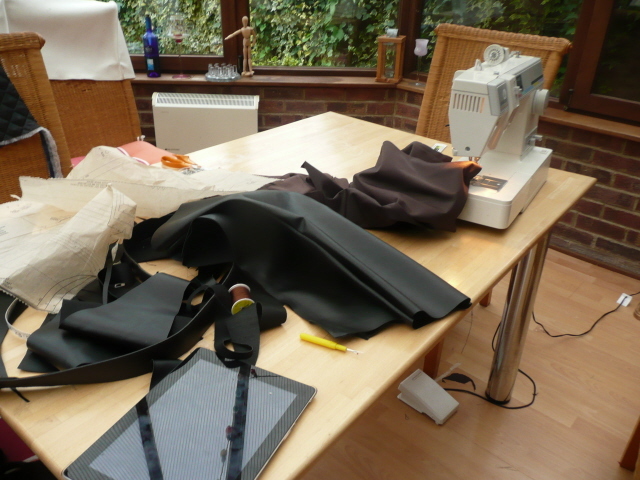 Miss Dunnit has been slaving (and I mean slaving) over a costume for MCM Expo this weekend. She has been on a steep learning curve too, because I have been steadfast in my resolve to not interfere and take over. Because I have been stupidly busy and she hasn't. But now she has a job and time is against her. And last night it all went a bit wrong and there was the frustration meltdown and I so utterly know how crushing that is. So on Tuesday afternoon I unpicked and re-jigged one thing and finished another. I forgot how much easier it is when you know how. 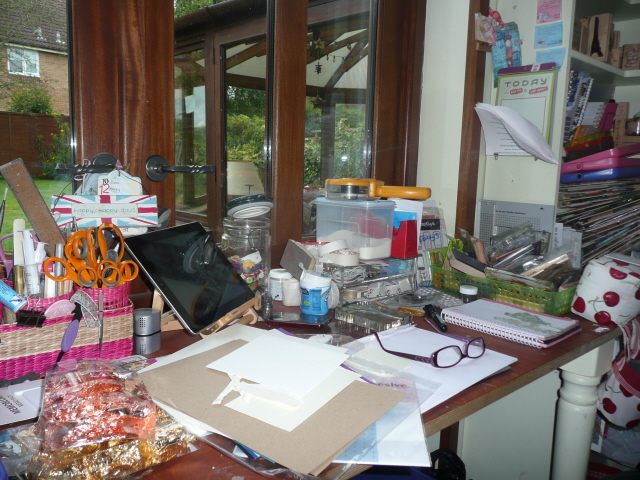 I also tidied the table and swept the floor before I started...it would seem that Miss Dunnit's method of messy working doesn't suit me. Which is an enormous double standard, wouldn't you say! So, there's the iPad, I was listening to an afternoon Drama on Radio 4. There's faux leather sleeves and under the needle is faux swede. Yes, Miss Dunnit is going to MCM as a character from Game of Thrones. It's all the rage, you know. Which of course, is why I know very little about it! I'm fairly sure she's not a reader, but I wanna wish my sister Sally a really Happy Birthday today. Younger than me or not, she's a cracker! Lastly - had a lot of feedback about the last two cards I've posted; and a lot of questions - I'll answer them tomorrow, it's all simple. Come on then, share the desk. Show us all what you're up to this foggy October day. 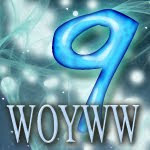 Upload a pic to your blog, put WOYWW in the post title, and link here. Eventually, we'll visit. It has to be said that turning off word verification helps enormously. And If your post isn't really related to What's on Your Workdesk Wednesday, you probably won't get any comments. If you were one of 40 people at Japonica's day long workshop yesterday, you will recognise this as the card I bullied you into making. If you weren't there, it's a variation of the card I put on my last post. In as much as it uses the same stamps. The rest, actually is quite different in terms of ingredients. Which goes to show that there's lots of very similar products out there and you need to take a workshop or two - they help when you're trying to find which product suits you best. Because you don't have to buy it to try it. But you already got that. Now, I will stop promoting workshops and go get on with something. Erm, probably workshop preparations! Artemio Hedgerow stamps. Background is a colour wash of Cosmic Shimmer Mists painted on in broad brush strokes. Stamp two ferns in Eden Green Stazon, stamp and emboss the central image with black ink, clear powder. Emboss the whole piece with the Cuttlebug or similar folder. 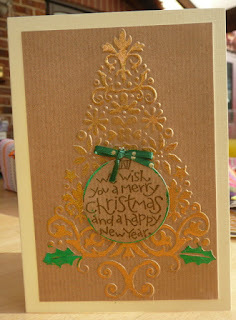 Use a Zig glue pen to highlight some of the embossed surfaces. Let it dry. Foil the glued areas. Mount. Mount again. And Again! stick to card. For me..a ten minute card. For a person that needs precision, possibly half an hour. I conducted a workshop on Thursday and this was one of the cards. It's a variant that will crop up at a workshop on Monday actually, but without this and that and adding that and this. Anyway, I made a mistake in the preparation of the workshop and so two gals didn't finish all the cards and so I promised to post it here for reference. Interesting isn't it...the fault lay in my slapdash attitude and 'that'll do' approach. One of the other cards also required 3 layers of matting. My method is this: stick the image onto the first mat and eyeball the trimming. And then repeat repeat repeat....I only briefly check each layer will still fit on the card face by holding it against the card briefly and that's how it works. For me. But of course, we don't all roll in this casual and alarming manner, and I did not allow for measuring and rulers and pencils and those sort of timings when I put the workshop together. See, it's a real quandry to me. I recognise that anyone who comes to a workshop and pays good money for it wants to receive a couple of tips they may not have heard before, maybe try a few products that they wouldn't dream of buying without the chance of trying...and ultimately, come away with something finished and nice. 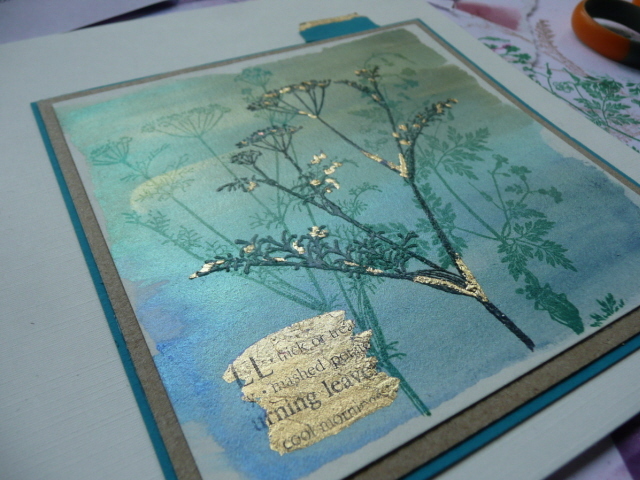 Mostly, my 2 hour workshops offer four cards. Logistically, it works well. But I do panic that if people don't finish, they may well feel cheated. 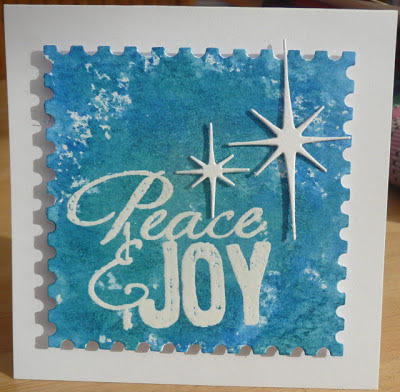 Although of course, there are those who come to the workshop and cheerfully don't do one or other of the cards because they don't like them - of course I have no problem with that - this is a very subjective thing, isn't it. There is a dynamic to be maintained at a workshop...the supplies need to be moved around so that no-one wastes time waiting, but you can't force people to hurry really, that's making them be slapdash and out of character if they work slowly, so then it's not a nice experience. Is there an answer? I don't know. In all the years I've been doing them, people have either been too polite to complain or it's not nearly as much of an issue as I think. It would be interesting to know what you think, if you are a workshop goer. Totally unrelated photo...but you love it when I do this, I'm sure! I've decided that you don't know someone till you've heard them. I can talk to you online, and I form a picture of your sweet self in my mind, but I don't think about how you'll sound. And that's kinda like the final part of the jigsaw. And after the Crop last weekend, I also realise that it's something you'll never be able to guess at. Pam, for example, came across the M4 from Swindon....all the time we've known her online, that's where she's been. In fact, she's lived there for more than a handful of years. So of course, colour me surprised when she talked to me in her warm and friendly Scots accent! And of course, a native of Liverpool, our Jo has a wonderful friendly scouse accent...which she can turn up and tune to the point of foreign! Combine that with her warm, look-at-you-all-the-time she talks to you attitude and you start to realise that however good online is, it's not the best. I noticed for example on her blog post yesterday, that Mary Anne was surprised that someone at the Crop was surprised to discover that she's American. Given my surprise on Saturday when we all chatted to each other, I'm no longer surprised! Is this making any sense at all? 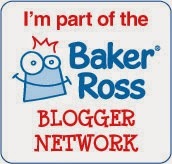 Mind you, as Kirsty said, our blogs are very much about us as individuals; we can kind of create an image, huh. I wonder if mine is completely destroyed for 20 odd WOYWWers now! If you're very clever, you could completely 'guide' reader opinion of your character and likeable-ness (if that's even a word - don't offer likeability as an alternative please, that's just as bad). I think I write as I speak. I know I have to type fast to keep up with the stream coming from my mind...and I frequently delete delete delete whole chunks of text when I'm editing...not to change your opinion of me per se, but certainly to reign in the unnecessary, uninteresting and frankly boring parts of my thought stream. Now, if you want to meet the counter opposite of the person you've got a picture of in your head ..you've just got to meet Donna. Now shorter of hair (!) than I remember, but otherwise, not at all who I thought I knew. 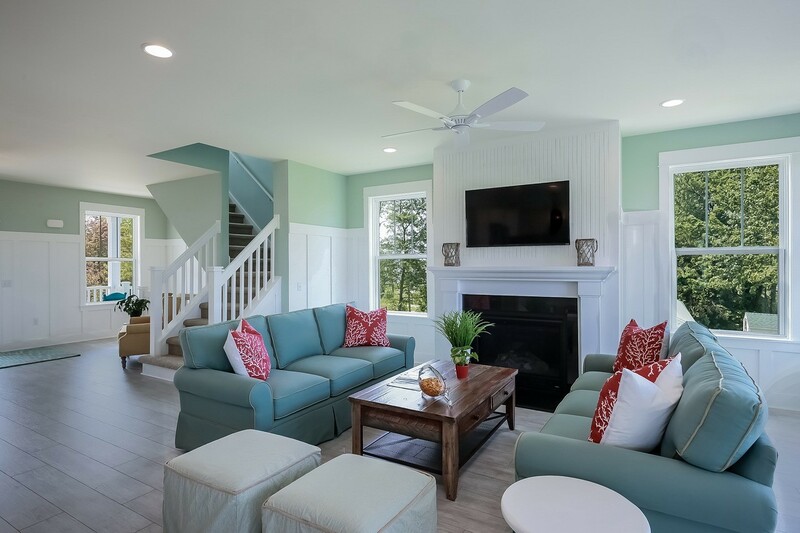 Quietly spoken and totally 'in the zone' as soon as she picked up anything crafty; it's no wonder she's prolific and creative. And so smiley. So now, if you want to meet some fellow WOYWWers or join any sort of craft group, how about it - get your gander up, courage to the front and put the call out. It's far easier than you think..and.....you'll know people for reals! As with most things that I'm involved in, I like to document it in my scrapbook. And so yesterday the one thing I did ensure to take with me was my camera. And ask me, dear reader, how many photos did I take? So many I can't choose from among them, probably. Yeah. Four. And two of those are so shakey that I can't tell what they are really. So that goes to my state of mind really. Shakey. I collected a trio from the station and that stopped me being shakey because they had already introduced themselves and were getting on perfectly well, and just piled into the little green rocket and carried on chatting. Phew. Zoe's bag..perfectly packed, perfectly proportioned and yielding enough stuff for more than a day...brilliant! Jan and G3 and important G had set up the hall while I erm, toiled at the steering wheel. We arrived almost as the majority arrived. LOTS of hugs, instant friendliness, because after all, we know each other don't we. It was so, so nice to see people and know that you're already friends. Important G was a brick, he hung around to take proper photos of us all as a group and it took some doing to stop us faffing! No doubt Jan's blog will be a far better place for photos. I've got loads of observations to share about meeting this selection of bloggers, but will take my time in writing them up. Meanwhile, the knee jerk reaction is this - it was fun, it wasn't nearly as scarey as I thought it would be (although there were a ridiculous number of cameras for a few minutes!). If you're a WOYWWer and wanna be involved in a meet - what's stopping you? Set it up! So, this week I seem to have been busy squaring up and finishing off some autumnal works of art - oh, OK then, call them cards. And all the time, I'm in the mood to make a few Christmas cards. Why does that happen? I do not know. But it gets in the way of what I'm meant to be doing. Or rather it doesn't, but it makes me impatient to move on. To this end, I've finished, tidied (really - even cleaned a whole overflowing basket of stamps) and started on a few Christmas ideas. The card above is not a product of today's snatched desk time. No. It's one I made for an event earlier this month, and which, if you're coming to the WOYWW Crop, you can make tomorrow. You can see how simple it is. So anyway, back to today. I've had a couple of ideas rolling around in my head for single layer cards to help the old 'quantity making' along. I spent ages and wrecked about 5 cards before I even got the idea from my head to a card, let alone before it started to look familiar as the idea I started with. But, these snags have not diminished my enthusiasm for the job at hand. Yet. Maybe that's because I'm so busy that I'm falling into that 'give a busy woman another job and she'll make time to do it' category. Maybe I'm starting to feel that inevitably, my attention must turn toward this Season. Maybe I'm scared that I'll get left behind. Or maybe, just for once, it's because with no immediate deadline or reason for making them, I'm feeling like having a bit of fun. Gawd, I'll be using glitter in a minute! If you do nothing else today, please visit Plan and browse their site, consider signing the petition and maybe get a little more involved. Most of my readers are first world women. Who once were first world girls. Our advantages and rights to education have already been fought for and achieved by previous generations. Time to make that happen again, elsewhere. The world is tiny and you're a part of it. 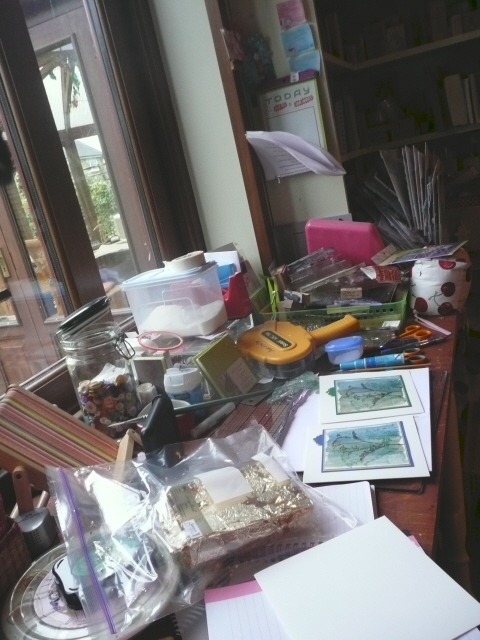 So here's my real workdesk, about 4.30pm Tuesday. It's got normal stuff on, enhanced by a large box of clear embossing powder - I was refilling a smaller tub..to be seen in front of the big yellow tape gun runner thing. Against which is leaning a small square green notebook. A gift from Lyn and her doodlybirds which is currently in use as yet another book of lists. Naturally. The gold leaf is in the bag and still in use...I'm playing about with samples for a workshop at Japonica in a couple weeks. And that's why you're seeing my real workdesk. Because it looks not at all bad. 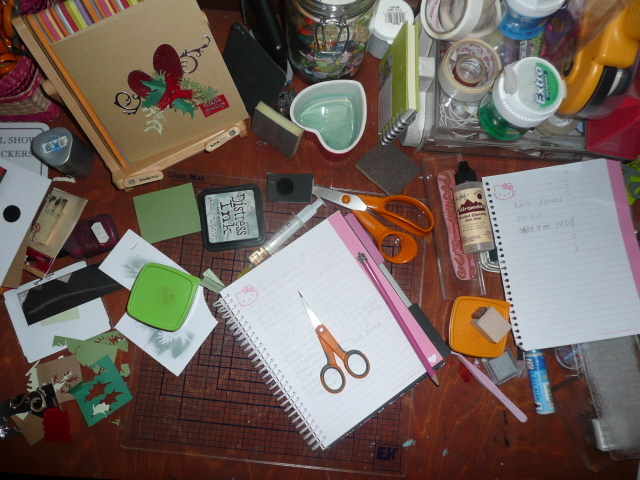 My other workdesk is the lounge floor where I'm tracing and cutting shapes out of paper. It's a long story and I've no doubt at some stage, you'll read about it on a WOYWW post! I'm trying to multi-surface multi-task and I'm not sure its a good idea. I think it just causes me to panic because everywhere seems untidy! Ah well. SO share your space, creative, working and tidy or not, we love to have a nose browse around your spaces. Please put WOYWW in your post title, link here and we'll come round and enjoy. Thank you. For your invitation and hospitality. Remember the give away of tickets for the Crafts at Christmas and Hobbycrafts show? Well the end of month deadline for adding your name to the draw has passed. And it passed without incident frankly. So now we've had an evening of family togetherness, I've at last been able to harness the power of Miss Dunnit as adjudicator and referee and Mr Dunnit as the random selector. You never knew it was so complicated did ya. Delighted to say that Misteejay came out of the hat/bowl/vase. See, it was a crystal bowl that I occasionally use for roses. So it was metaphorically, a hat, but in reality a bowl/vase. You could always click away...but this sort of logic will haunt you. So well done to Toni, I know it wasn't an arduous task, but I bet we're all glad that's over! Janet of Fairythoughts has also volunteered to conduct a classette, which is so nice of her it leaves me breathless. Check out her blog post for details. Janet will teach you and let you actually make something beaded. I won't spoil the surprise - go look at her blog...it's amazing. A 'dry craft' doesn't mean no ink, honest. Nor does it mean that you can't make a mess. Good grief, I can't unpack my tote without making a mess! It does mean that batik, tye dyeing, hand felting and the like will be a tad inconvenient for those of us planning to use the kitchen for a real craft. Cooking. Shopkeer Gal will not be able to supply a shop. But that's OK...if you aren't taking a class and fancy a little visit, I'm more than happy to drive a car full over to her place. Show you our gorgeous locale and a craft shop...what's not to like! I'm going to be sending directions over the weekend. Look out for 'em, won't you. Take a mad idea, (Jan) put it to a few internet based WOYWWers and watch it bloom into a reality. That's how it's feeling right now. So here's some info about the WOYWW Crop that you need to know if you're coming. It's on Saturday 13th October. It's to be held in the village of Burbage, Wiltshire. If you've emailed me to say that you're coming, you will receive an email from me soon - with driving directions and postcodes and such stuff as is necessary to get there. We need to know if you're coming before you turn up. There's table numbers to consider, and more importantly, there's catering to be done; the thought of spreading it too thinly makes Jan and I giddy with hunger. The cost will be roughly £10 per person. It simply is to cover hall hire and food; if there's any profit, Jan would like to nominate The Wiltshire Air Ambulance as the beneficiary. Bring a dry craft to do. If you want to knit, stitch or darn, no problem. 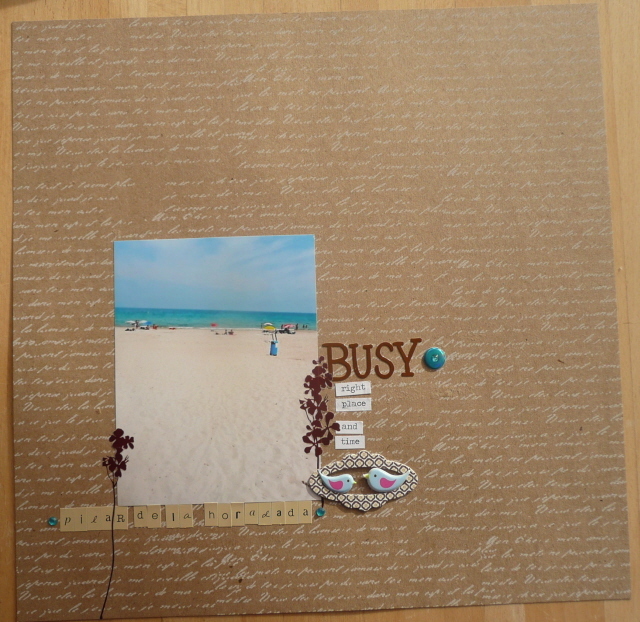 Scrapbooking, card making, whatever it is you want to do, bring it with you. Don't worry if this involves turning up in a lorry, you will be in good company! 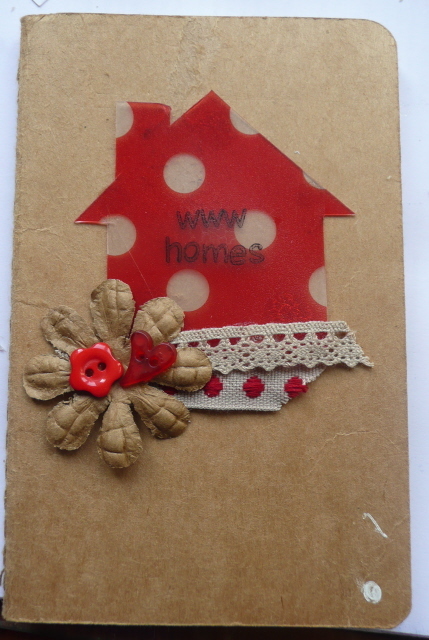 one for selling unused/unwanted stash - label it with your name and a price and put it on the table. one for giving away stash that you no longer want/part used or that you simply don't think you can charge for. Swapping is not uncommon. If you want it to be a swap...label it with your name so that you can be approached. one for selling any hand made goods that you produce for sale (for example, Jan will have some Fabric Frenzy products). Again, mark them clearly with name and price. 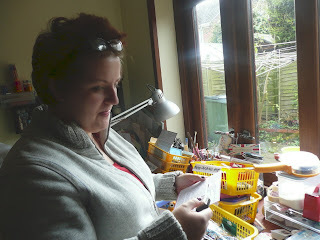 Our Diane (Morti) will be running a demo/tuition about the fantastic altered dominos that can be found on her blog. If you want to have a go, please bring your own domino(s). Consult her blog for real info, this post in particular. It 'starts' at 10.00am....you don't have to be bang on time, it's just that there has to be a start and stop time really! We'll pack up at about 4.30. Please don't bring presents for Jan and I, there is no need. We want to meet you, have a fun day of chat and craft and not cause any pressure or stress. So, if you haven't yet, email me - juliadunnit@me.com to let me know you're coming. It will be fun. Jan promises. Well, the 2 Scrap Ladies Card Marathon day is now but a memory. Except for the few stamps I still have to clean...in the basket at the far end of the desk. But they're Christmas stamps, so I won't need them for a while. I'm getting back into season, have an urge to do something in Autumnal hues. Ok you guessed it - another deadline looms and this time its for something seasonal. So my desk today has been the 'blank page' starter desk. I've got the prescribed ingredients out - the stamps I must use, the product (gold and copper leaf, yum) and card stock...and have spent some time fiddling around making up some sketches and trying to get the ideas flowing. I think you can see from here that the cherry fabric is my desk bin that Jan made for me, the chewing gum is centre desk in a big blue pot, and the ipad's there on the little deckchair - fear not Bridget, if it's not there it's just being recharged somewhere less convenient! Thought you'd like to see this. Miss Dunnit, last week, checking through my workshops baskets of 'ingredients' against the lists of what should be in them. She doesn't wear glasses, but look how she wears mine; like I do when I don't need them for reading...is that because she wants to be like Mumma, because she's taking the erm, or because she saw me coming with the camera? 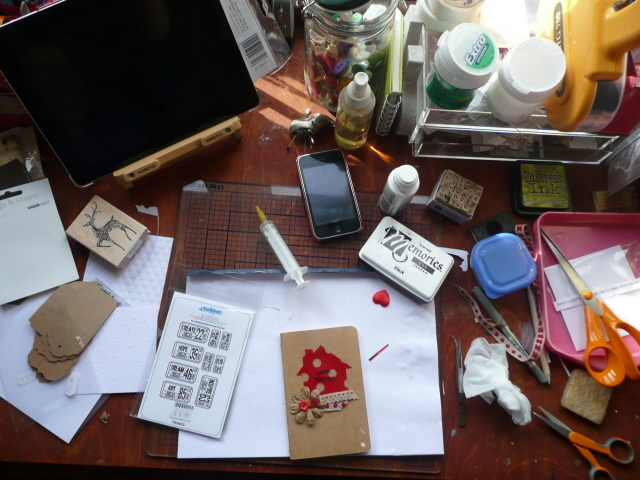 Share your workspaces with us please, we like to see what you're doing and where you're doing it. 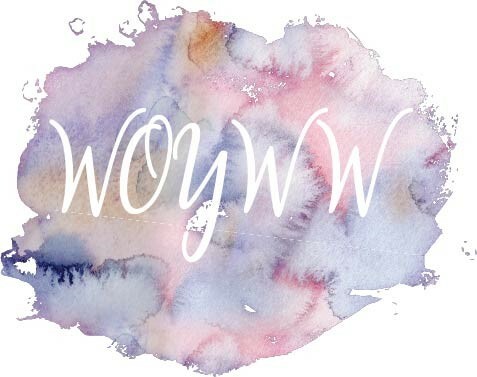 Make a quick post to your blog that includes WOYWW in the title, then link it here. Reciprocal visiting is de riguer. Thank you! Oh and sorry to hijack it for publicity - but if you want to read about the WOYWW Crop Meet on Oct 13th, please pop back for tomorrow's post. Thank you!